Google’s own research back in 2015 into the user experience of promotional mobile interstitial ads found that 69% of visitors confronted with the ad promoting the native Google+ app abandoned the site altogether. So it came as little surprise – following the Mobilegeddon algorithm update – that Google would add this to their list of factors determining ranking for mobile sites. When it comes to search on mobile devices, users should get the most relevant answers, no matter if the answer lives in an app or a web page […] sometimes a user may tap on a search result on a mobile device and see an app install interstitial that hides a significant amount of content and prompts the user to install an app. Our analysis shows that it is not a good search experience and can be frustrating for users. What does this actually mean for websites? It means that mobile sites whose interstitial advertisements are deemed to hide ‘a significant amount’ of page content on transition from the search result page will no longer be considered mobile-friendly. It doesn’t currently impact desktop or internal links on your site. Google said this means “pages where content is not easily accessible to a user on the transition from the mobile search results may not rank as highly”. Google’s research always seemed destined to confirm what many marketers – regardless of personal feelings – thought of this style of ad, and indeed the CTR was found to be 9%. However, where Google’s study departed from the ‘necessary evil’ view was in their follow up banner ad campaign which found that one-day active users increased by 17% while iOS native app installs fell by only a (statistically insignificant) 2%. 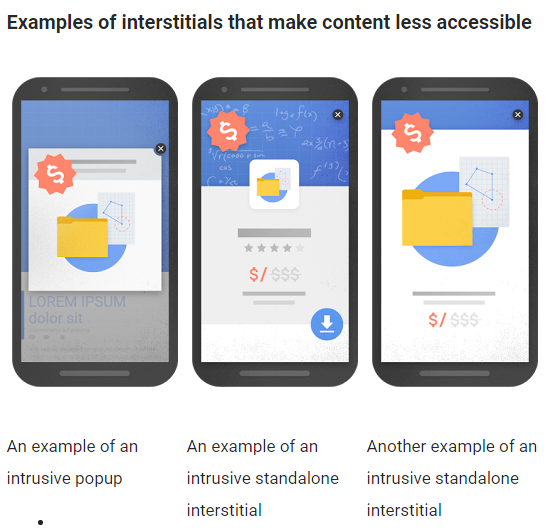 This appears to have convinced Google that a move to penalise the use of interstitials would cause no real harm to a brand’s ability to advertise while the benefits to a mobile user’s browsing experience would far outweigh any negative impact. It may work technically – but has it worked for your consumers? With a number of brands failing to take note of the early warnings (from Google’s ‘Webmaster Central’ blog) of the Mobilegeddon update forced to rush out last-minute mobile-friendly websites, it remains to be seen what percentage of mobile searches will ultimately be affected. Contact us today to discuss how we can help to future-proof your mobile site.